Showroom Hours Monday-Friday 8 a.m. – 5 p.m. Serving 1000’s Of Satisfied Customers For Over 39 Years. 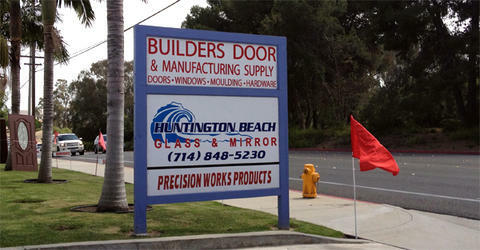 Huntington Beach Glass is a full service Glass shop. Small job, large job, we can help! From replacing broken glass, designing custom showers, installing mirrors, personalizing your cabinet faces with a variety of textured glass, to enhancing your ocean view with glass railings or windbreaks. We’ll give you the time necessary to assist you with your Glass & Mirror project. We’ll assure the very best in quality glass, mirrors and doors. Courteous, friendly and reliable service, always! Huntington Beach Glass services customers throughout Orange County & some sections in Los Angeles County, including the cities of Balboa Island, Belmont Shores, Buena Park, Corona del Mar, Costa Mesa, Cypress, , Fountain Valley, Fullerton, Garden Grove,Huntington Beach, Irvine, La Palma, Long Beach, Los Alamitos, Midway City, Newport Beach, Newport Coast, Orange, Rossmoor, Santa Ana, Seal Beach, Stanton, Sunset Beach, Surfside, Tustin, Villa Park, Westminster, Yorba Linda, Long Beach, Lakewood. Broken Window Repair, Beveling, Cabinet Glass, Custom Shower Enclosures, Custom Bathtub Slider Glass, Cast Glass, Commercial Glass and Glazing, Custom Mirror Specialist, Door Closures, Dual Pane Replacement, Etching, Sandblasting, Glass Beveling, Glass Railings, Glass Steam Units, Mirrored Wardrobe Doors, Nail on Windows, Patio Track and Roller Replacement, Replacement Windows, Aluminium Windows, Fiberglass Windows, Screens, Tabletops, Vinyl Windows, Wardrobe Doors, Wardrobe Track and Roller Replacement, Wind Breaks, Glass Tabletops. Whether your project is small or large HB Glass company’s goals and dreams ofproviding custom design and excellent service had always been the # 1 priority. Comeon down to our showroom to see how our experts can help you. Let us build your vision in glass. 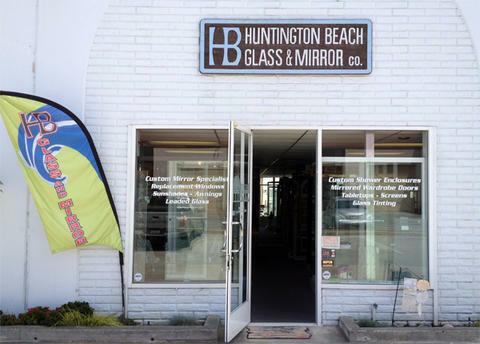 Whether it be residential or commerical, Huntington Beach Glass and Mirror, Inc. utilizes the professionalism and workmanship of it’s own staff of installers. Call 714-848-5230 Today To Schedule Your Free In Home Estimate!